The proliferation of text messaging has created a casual attitude toward communication that has spilled over into the workplace. Quips and acronyms such as LOL, OMG, and SMH weave their way into business emails, where they are eroding formality and undermining intellectual standards. Importantly, research studies are finding that those who fall into lazy communications habits like these are often passed over when their organizations consider raises and promotions. Equally important, customers lose confidence when they encounter unprofessional writing and may look for another place to do business. So, those clever verbal shortcuts could end up costing “u” in your wallet. Professionals with fewer grammar errors in their profiles reached higher positions than those with more mistakes. Those who failed to progress to a director-level position within the first ten years of their careers made 2.5 times as many grammatical errors as their director-level coworkers. Fewer grammar errors correspond with advancement. Professionals who were promoted six to nine times within the first ten years of their careers made 45% fewer grammar errors than others who were promoted far less often in the same time frame. Those with fewer grammar errors were able to change jobs frequently to advance, while those who remained at the same company for ten years or longer made 20% more grammar errors than those who held six jobs in the same period. This could be explained in a couple of ways: People with better grammar may be more ambitious in their search for promising career opportunities, or job-hoppers may do a better job of revising their résumés between jobs. Spell check will usually catch typos and other spelling errors, but grammar analysis is complex, requiring an educated understanding of the relationships between words. For this reason, many employers will examine an applicant’s cover letter as carefully as their résumé. Many employers look for clues to determine an applicant’s ability to think through deviations from the norm — it’s an essential job skill. Your cover letter shows whether you can build properly structured sentences that are customized to their company and its needs. In other words, they want to see that you can analyze the opportunity and think through your response to it. In 2013, communication experts Global Lingo polled 1,029 adults on their attitudes towards online browsing and purchasing, and found that 74% of consumers notice the quality of the spelling and grammar on the websites they visit. Also, 59% reported that poor grammar and egregious spelling errors would make them reconsider purchasing from that website. If you want your email, cover letter, and sales messages to do a good job of advancing your reputation for intelligent communication, then rely on the editors at Wordzen. One of them will review your outgoing message and adjust it to perfection. We correct your spelling and grammar and then go further to ensure solid sentence structure, proper tone, and overall clarity to make your point. Wordzen has always been available to help you with typed emails, but if you find yourself pressed for time, consider using our recently unveiled voice-record option. Speak your responses into your computer or phone to make email handling quicker on your end. 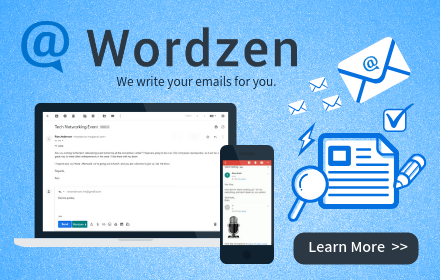 Then, Wordzen’s editors will listen to your recording and write an email that suits your needs. Bottom line: With Wordzen, it’s easier than ever to save time while creating email communications, cover letters, and sales letters that make a real difference to your career.